PORTLAND, Ore. Toronto's Amir Johnson threw his mouthpiece at an official and had to be restrained by teammates after he was ejected from the Raptors' 92-74 loss to the Trail Blazers on Monday night. Fellow players had to restrain Johnson before he was escorted from the floor. Johnson said he has a habit of rubbing the ball before handing it to the ref during free throws. While it appeared that the two had words, Johnson claimed nothing much was said. He said he got frustrated when he wasn't given an explanation for the ejection. "I guess the ref didn't let me have the ball so we kind of got into a tug of war," Johnson said. "No words were really said and he rejected me out of the game and I kind of lost my cool from there." CBSSports.com's Royce Young says the habit of a player grabbing a ball after a free throw is fairly common so it's strange that Jones wouldn't let him collect it. "Not to condone Johnson's actions, but sometimes you can at least see where the players are coming from in their frustrations with officials," Young writes. "Why wouldn't Jones give him the ball? That's a pretty standard practice thing at the free throw line. The one thing players won't stand for when it comes to officials is not being fair. And likely in Johnson's point of view, Jones was singling him out and showing him up." Johnson, a reserve forward/center, is averaging 7.3 points and 5.4 rebounds this season. He finished the game with four points and four rebounds in just over 10 minutes. The Raptors needed him in the game after starters Andrea Bargnani and Kyle Lowry both left with injuries. Toronto was already without forward Linas Kleiza because of a sore right knee. 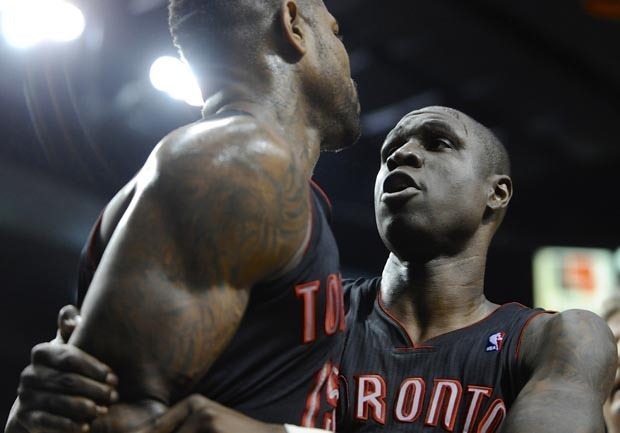 Raptors coach Dwane Casey said the reaction was uncharacteristic for Johnson. "I don't know what happened with Amir. He kind of lost his mind there for a little bit," Casey said. "I told him we can't have that on a night where we're short-handed and we're in a situation where we're scrambling. We just gotta have more discipline than that." Johnson agreed that it was unusual for him to act out. "My teammates know me, my parents know me ... I never lose my cool. I never said anything to a ref or got mad," he said. "The only techs I've gotten were for hanging on the rim or slapping the backboard." Johnson, who is in his eighth NBA season, is likely looking at a fine from the league for the incident. Following the game, however, he was contrite. "I think it was just really childish. It was something that didn't need to happen," Johnson said. "I lost my cool and I apologize on my part."